Scheels Women’s Night Out – Oct 2016 – Each One. Tell One. 100% of ticket proceeds will go to Each One Tell One. 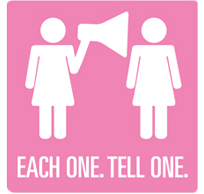 Each One Tell One is a local non-profit focused on raising Dense Breast Tissue awareness for early breast cancer detection. Tickets are on sale at customer service in SCHEELS and also at the link provided. Please email eventsRS@scheels.com with any questions.